Cocoa Cardamom Mousse Face Scrub is made with oils and butters to nourish sensitive skin while the fine sugars will exfoliate and gently remove dry skin cells that accumulate on the skin surface, leaving your skin with a beautiful glow. The cocoa fragrance is pleasant and scrumptious. This is a coconut milk based cleanser that is very gentle and moisturizing on dry skin. Recommended for combination skin to balance complexion. This moisturizing face wash will form a light conditioning lather. 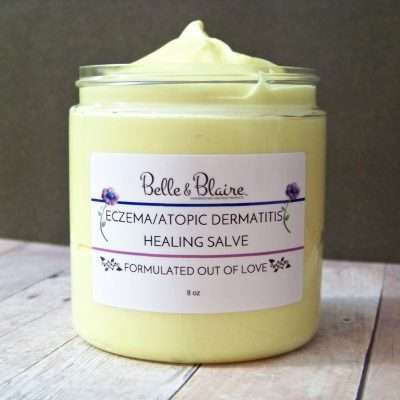 Eczema/Atopic Dermatitis Healing Salve is an all natural product that is made with skin soothing butters, plant oils, botanicals, and essential oils. Formulated for eczema, dermatitis and psoriasis sufferers that would benefit from a mix of natural ingredients to instantly soothe irritated skin as a result of itching and scratching. Dry patches will be soothed and dissipate with continued use. The ingredients in this cream supports cell turnover which promotes new skin formation. This bar is the aroma of oatmeal, milk and honey with notes of orange vanilla and smells amazing. Exfoliating moisturizing butter bar is for massaging off dry flaky skin while keeping skin soft and moist to the touch. This bar is especially great in the winter months when skin is more prone to becoming extremely dry and rough. Enjoy the exfoliating and moisturizing effects of this special bar. There are no added dyes or coloring. Marshmallow Coconut Pink Pearl Shimmer Elixir is a smooth and light marshmallow coconut scented oil that contains a beautiful pink iridescent body shimmer that will give your skin a subtle sparkly glow. Also recommended for the hair to tame flyaways and add shine (not recommended for fine and/or oily hair). Perfect for any occasion. Moonstone Blue Tansy Face Balm is not to be taken lightly. The Blue Tansy oil contained in this special facial balm is an expensive and a very rare oil that is highly sought after in the skin care industry. The oil is gaining significant popularity because of the many healing, regenerating and therapeutic benefits it provides. The healing properties of Blue Tansy essential oil comes from the azulene pigment that gives the oil its striking sapphire color. The high quality of Blue Tansy oil has the ability to help heal skin wounds and conditions that include burns, blisters, acne, boils, dermatitis, eczema and rashes. Organic Blue Tansy, also known as Moroccan Chamomile, is a highly curative oil that has real tissue regenerating abilities. Its botanical aroma properties makes for a lovely scent and will promote relaxation and a feeling of ease; however, the real power of this deep blue oil is in its therapeutic effectiveness. As an anti-histamine and anti-inflammatory remedy, Blue Tansy oil is particularly useful for people with asthma, emphysema, pet or indoor allergies and anyone in need of respiratory support. 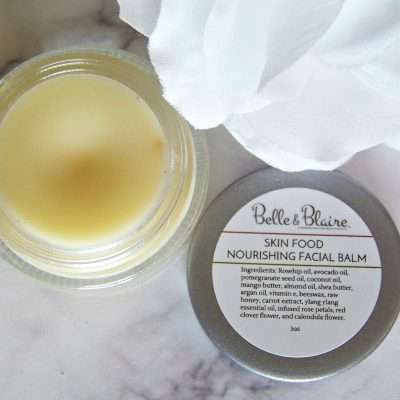 Skin Food Nourishing Facial Balm is made with 100% pure natural plant ingredients to smooth, regenerate and moisturize your skin. 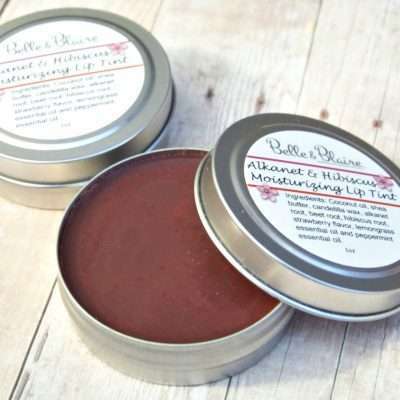 This balm boasts nothing but skin loving organic plant oils that have been added to give your skin the extraordinary glow that you are looking for in a skin care product without leaving an oily, sticky residue. Wear this as a moisturizing balm under your makeup and/or apply at night as a balm after makeup removal and cleanse. The ingredients in this special formula balm is full of skin loving plant oils and essential oils that will calm the nerves while giving you as new fabulous glow. The active ingredient Organic Blue Tansy, also known as Moroccan Blue Chamomile, is a highly curative oil that has real tissue regenerating abilities. The light botanical aroma makes for a lovely scent; however, the real appeal of this deep blue oil is its medicinal effectiveness. The healing benefits of Blue Tansy Essential Oil comes from the azulene pigment that gives the oil its striking sapphire color. The high quality of the oil has the ability to heal burns, blisters, acne, boils, dermatitis, eczema and rashes. Blue Tansy Oil is also good for tissue regeneration and it can remedy both wounds and wrinkles. In addition, inhaling Blue Tansy Essential Oil has therapeutic benefits as it’s helpful for people that suffer with anxiety, insomnia, asthma, and seasonal allergies. The aroma of Blue Tansy Oil is relaxing and gives a feeling of ease.